Cholinergic Urticaria Symptoms: What Are the Signs of Cholinergic Urticaria (chronic heat hives)? 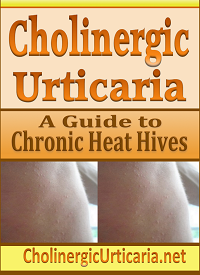 What Are the Signs and Symptoms of Cholinergic Urticaria (Chronic Heat Hives)? Individuals with Cholinergic Urticaria often have no symptoms at all when they are not being exposed to a heat stimulus. They can function normally and appear to be healthy. They only begin to exhibit symptoms when they are exposed to the physical stimulus (i.e. heat). Once the individuals body temperature rises (as a result from exercise, anxiety, nervousness, etc. ), he or she may start immediately going into a hives reaction as a response to the heat (and subsequent acetylcholine release). Symptoms usually appear quickly, and may persist until the individual either cools down (reduces body temperature), the individual sweats, or the reaction subsides on its own. Uncomfortable Sensation when warming–Individuals may feel a slightly uncomfortable feeling in the skin as their bodies become warm. This is often an indicator that a hives reaction is imminent. Extreme Itching (pruritus) during the hives reaction. This may occur anywhere on the body, but often occurs on the face, scalp, and upper torso. Many individuals also feel the sensation on the legs as well. It may affect different parts of the body at different times. The itching often occurs in waves and random points all over the body during the reaction phase. Individuals often feel compelled to scratch vigorously during this reaction, however, scratching does not resolve the itching. A Prickly “tingle” sensation which may feel slightly painful or uncomfortable. This often occurs along with the itching. It often feels as if someone is pricking the individual with a small needle. This sensation can occur simultaneously over the entire body, with the feeling of hundreds of “prickles” within seconds. They sting and itch at the same time. Burning sensation on the skin–Individuals may feel as if the skin is being burned in a very uncomfortable way. Flushing of the skin–Flushing of the skin may occur in localized or widespread areas. Flushing is the reddening of the skin as blood vessels leak fluid near the skins surface (similar to “blushing” when embarrassed). The flushing skin is often warm, redder than usual, and my itch. If scratched a small wheal may appear. This usually disappears once the hives subside. Pinpoint Hives–Individuals may see tiny pin-point hives after an intense reaction. Not all individuals see the hives, and some only experience flushing, itching, and a prickly sensation. These hives are often small (about the size of a pen’s point). They are also usually red in appearance. In general, these hives only appear after a reaction, and often go away within 10-35 minutes leaving no trace. Sometimes, they may appear as raised goosebumps during a reaction. Small Wheals or Raised Welts–Small wheals (raised areas of the skin) may appear, particularly if a person scratches vigorously during a urticaria episode. These often disappear once the reaction subsides. These are usually very small and look like bright red scratch marks. They are a result of the skin’s hypersensitive state and histamine release during the reaction. General Anhidrosis or Reduced Sweat Functions–Many individuals with this disorder will have significantly reduced sweat functions. Many find it very difficult to sweat, even after strenuous exercise or hot weather. Instead of sweating, they often experience the hives reaction first. Sweating can usually occur after the individual is able to withstand a hives reaction, is exposed to exercise (with intense focus) and/or intense heat (preferably with high humidity levels). These symptoms usually begin to subside immediately if the individual can avoid the situation that is causing the hives reaction. So if they are outside in hot weather, going indoors and cooling off with water or an ice cube may stop a reaction very quickly (sometimes almost instantly). In just minutes after this reaction, most individuals have no trace of the hives or feel any itching. The individual does something physical, comes into a warmer environment, becomes excited, nervous, releases adrenaline, or eats spicy food. Basically, the individual does something to make the body heated or excited. The individual will then often feel an uncomfortable sensation as their body becomes heated. This is often a precursor to the reaction. Then, a tingling sensation that itches, stings, and burns all at the same time with great intensity begins to develop in random places. Once the individual feels the oncoming hives, they can often quickly cool themselves to abort the reaction. If the reaction persists (or the individual cannot cool themselves down in time), the reaction often gets more severe. The itching is very intense, and tiny “stings” are felt in random areas in a very rapid and widespread fashion. The individual may start scratching fiercely, or quickly move to cool themselves down if possible. If the individual cannot stop the reaction or cool off, the skin will usually become flushed (red) in areas, wheals (or raised red streaks or areas) may develop, and there may be small pinpoint marks appear on the skin. There is an intense period of itching, stinging, and burning during this entire outbreak. After the outbreak is over, the body begins to calm down. A person may feel tired or “drained” (lacking energy) after an attack. The skin will eventually return to its normal color & most of the pinpoint red bumps or marks will also disappear, usually within 10-60 minutes. Rarely, some individuals may have the hives remain for a few hours. Below are the basic patterns in more detail that most cholinergic sufferers experience. Symptoms may vary slightly (depending on their level of hypersensitivity), however, and this is just a basic pattern that many cholinergic sufferers (including me) experience. It may not be the same for everyone. As mentioned above, people with cholinergic urticaria typically have no symptoms unless a reaction is occurring. Just like a person allergic to peanut butter or pollen is perfectly fine unless something happens to bring on a reaction. In what I refer to as “stage one,” a person experiences no symptoms, however, something will happen that will soon induce a symptom. For example, he or she may be inside with an air conditioner on a hot day. He or she then walks outside & it is 100 degrees. They will most likely start to experience symptoms within minutes. Again, it can be anything that stimulates or heats the body. Being nervous, eating hot or spicy foods, exercising, doing strenuous physical activity, taking a hot shower, laughing, getting angry, going from a cool climate to a hot climate, etc. Usually, symptoms begin by the sensation of a small prick or sting that also itches. Cholinergic urticaria can be felt over the entire body, however, some individuals (like me) mainly experience symptoms of the upper body (such as the neck, arms, back, chest, stomach, face, scalp, etc.). On extremely intense reactions, it can radiate through the entire body rapidly. A few pin pricks will indicate an outbreak is beginning to occur. Usually, you may feel a prick in a few areas (for example, you may feel a sharp prick on the back of the neck). At this point, if you can cool yourself off (by going into a cool area, taking a cool shower, spraying your body with cool water, etc. ), then the attack can usually be stopped & avoided in most cases. However, if the body does not cool down, the symptoms will quickly worsen within seconds. Suddenly the prickly, itchy, and burning feeling will spread. It will increase in intensity to the point where it will be almost impossible not to scratch the prickly feelings (however, scratching does not relieve symptoms at all). This is usually an incredibly frustrating, painful, and uncomfortable feeling for the individual. The individual may also feel very strong feelings of frustration, embarrassment, or anger. At stage 2, the intense feeling begins to overcome the body. It is impossible to ignore or control. It is very intense. However, at this point there may not be any physical symptoms that appear. This is frustrating & can make the individual feel as if they are being tortured or punished. However, at stage 3, symptoms will begin to appear if the hives last long enough (in most cases). These symptoms will be extremely red & flushed skin (looks like you have been scratched badly), there may be the appearance of a rash, small bumps or “pinpoint hives” may appear in the areas itching. Also, there may be small wheals (raised red or white areas on the skin’s surface). At this point, the itching is still usually intense, but may begin to stop & slowly stop itching, stinging, and hurting so badly. In this stage, the hives may begin to stop reacting the feelings may become less intense. The entire sensation & feeling could last between a minute to several minutes. At this point, the person will begin to feel calmed down. If the attack was severe, the person may feel very “drained” and tired (both emotionally & physically). Feelings of depression or sadness may occur due to the experience. During the reaction, histamine is being released in the body & the body is releasing other chemicals to balance everything out. This creates a relaxed or “tired” feeling after the feeling has subsided. Eventually, the hives will go away & the body will return to normal. The entire episode could literally start & end within a 15 minute time period (or less). Any physical symptoms/signs, such as red flushed skin or hives, will generally disappear without leaving any sign that they were even there. Although, it could take as long as an hour or so for all symptoms to completely disappear.